Last Monday I was invited to take part in the 4Talent Mobile Games Pitch. This event, now in its second year, saw nine finalists chosen from over 200 entries and invited to Channel 4’s headquarters near Westminster for an intensive day of presentations and mentoring sessions about games design, the potential of the mobile platform, and the art of delivering a successful pitch for a creative project. At the end of the day, each finalist would pitch their game idea to a panel of judges, with the winner being presented with a £1,000 prize at the 2008 Golden Joystick awards, and the option of a placement at EA Mobile and/or Nokia (the specifics weren’t entirely clear on the day). The mentoring sessions were hosted by Sergio Falletti (Future Platforms), Jeferson Valadares (EA Mobile) and Alex Bubb (Nokia PR). Alex Bubb’s session went into great detail about the new possibilities for mobile games offered by Nokia’s recently relaunched N-Gage gaming platform. All games on the N-Gage deck now offer trial versions and have consistent community and multiplayer features modelled closely on Xbox Live’s interface. I’d been sceptical of the N-Gage initiative in the past, viewing it as a walled garden with the odds firmly stacked against it, but Alex argued convincingly that in the wake of the iPhone App Store the mobile operators took a more welcoming view of manufacturer-owned channels. The fact that Nokia have now managed to implement the platform across all their main Symbian-powered handsets may make N-Gage more appealing to games publishers. (This allows for a single SKU to be put in front of an audience potentially far larger and, importantly, more global than the iPhone’s – the Golden Egg that Scott Foe had so graphically alluded to in the quote above.) It will be interesting to see how the market gets carved up between N-Gage, iPhone, Android, traditional J2ME and BREW, and probably some others I’ve forgotten. Jeferson Valadares gave advice on how to clearly define the scope and purpose of a project, using seemingly obvious but easily overlooked techniques such as trying to summarise the game in one sentence or to script the first three minutes of gameplay. The challenge was to give an accurate impression of what your game was about while at the same time making this engaging and understandable in the context of what the audience was likely to be familiar with. Finally, Sergio Falletti gave some pointers on how the designs we’d refined and polished through the day could be effectively condensed down into a fifteen minute oral presentation. This was an exercise not unlike structuring an essay: starting with question or argument, the audience would then be led through a brief discussion of different aspects of the game, starting with the basics, then layering on more complexity before addressing issues sparked off from this (such as, in my case, how the game would exploit connectivity, how information would be conveyed to the player and the technical and commercial feasibility of the project). After cakes and frantic final preparations, we were led into the Channel 4 boardroom to present our pitches to a panel of judges, in a format not unlike that of Dragon’s Den or The X-Factor. On the judging panel were Tim Harrison (Electronic Arts, previously head games honcho at Vodafone), Scott Foe (Nokia), Mandy Pollard (Channel 4 Mobile) and Robin Always (Future Publishing). The eight finalists came from fairly diverse backgrounds and as such there was almost no overlap between the ideas pitched. Many of the pitches made creative use of the camera, GPS and connectivity functions that are becoming increasingly commonplace on modern handsets. I thought the best example of this (although there were several other strong ideas) was in Matt Watkins’s game “Running Rings”, which was based on the simple but significant realisation that the scale between real world space (plotted by GPS) and game space does not have to remain fixed. 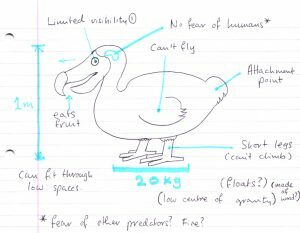 As I love to make things difficult for myself, I largely ignored the brief’s preoccupation with using exotic technical features and pitched a fairly traditional game (Way of the Dodo) that I was confident could feasibly implemented across a wide range of devices, and would appeal to the market. My game, Way of the Dodo*, was pitched as an adventure/puzzle title with a core mechanic (guiding indirectly-controlled agents to an exit) rooted in the tradition of Lemmings, Flicky, Krusty’s Super Fun House and Chu Chu Rocket. Instead of discrete levels, the game would be based around a free-roaming environment which the player would be prompted to explore to figure out methods to get the birds to cooperate. As the game progressed information would accumulate in the player’s Journal (similar to the lore scans in the Metroid Prime games). The intention behind this design was to teach the player some basic concepts of how the natural world works and why conservation is a Big Deal through the mechanics of the game itself, rather than by lecturing them with facts and figures. My main inspiration for this approach had been Sim City (for obvious reasons) and the morality system in Ultima IV, both of which teach ideas that are applicable beyond the scope of the game. The winning pitch (Finders Keepers) was made by Tobias Rowe, a games design student from Colchester. Within the opening minutes of his pitch it was clear that he had struck upon an intriguing concept: a game in which the players, as notorious cat burglars, could stage attempts to break into other players’ vaults which was perfect for the medium and made a social aspect of the gameplay integral to the game. The idea of leaving personalised calling cards after successfully robbing your friend’s trap-laden vault was a particularly inspired touch, seemingly designed to spark off escalating feuds between committed players. I’m sure that this game, implemented well, would be a huge hit whether realised on mobile or social networks (or better yet, on both). *A title with several meanings: something going the way of the dodo, meaning extinct, implying that the game was about endangered species; the fact that you’re tasked with guiding the dodo’s “way” to the exit; a play on the naming convention for kung-fu games/films (e.g. “Way of the Exploding Fist”, “Way of the Dragon”, etc. ); and finally a tongue in cheek comment on the state of the mobile games business. I thought about calling it Dodo Agogo, but that would be silly.